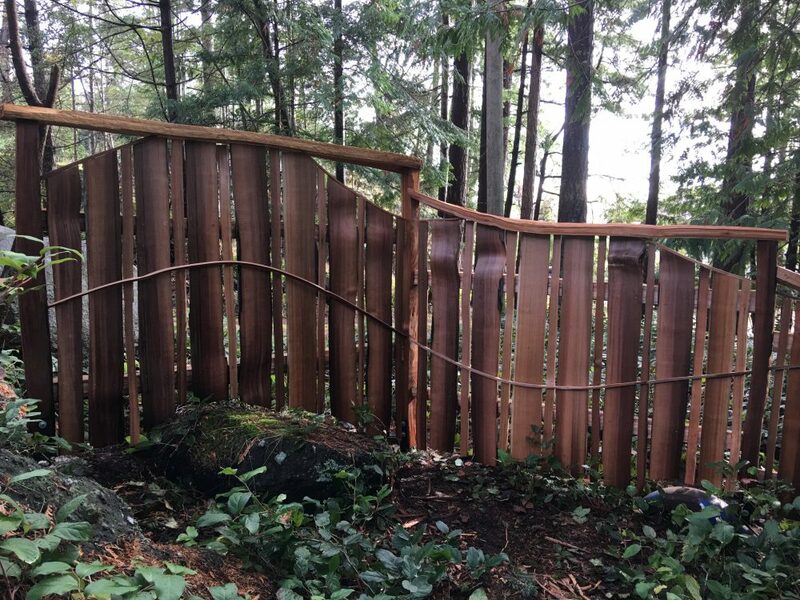 To keep me out of trouble this winter, I spent my time building a wonderful entrance and fencing project for the Mudie’s here on Pender Island. As always, my favorite wood to work with is reclaimed red cedar. I salvage the wood and split it by hand into bolts that I can transport back to my workshop. Once at my shop I can decide what the wood will be used for. Is the quality (tight grain, colour, curves and unique features) good for furniture or gates? Would it make better fencing? This project started with digging holes as all fences do… I pour concrete to set metal saddles, which I then bolt the posts to, keeping the wood up off the ground by a couple of inches. 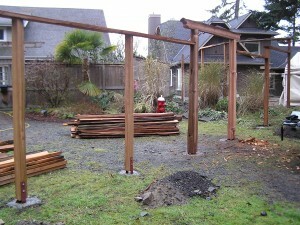 From there I build the framing structure of t he fence, hand split cedar posts, rails and capping. Then the cedar grapestake fencing goes up, choosing the style and patterns that fit with the project. 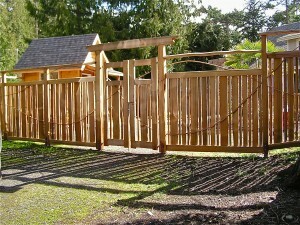 In this fence we chose an open, more see through style for the entrance, and a more solid tall fence around the sides. 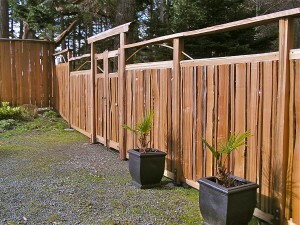 The entrance is more formal, yet still rustic with the handsplit fencing. The grapestake pickets alternate wide and narrow, and are set into a rabid on the backside of the rails. There is an open window space above the top rail, of about a foot and a half under the cap rail. This feature make the entrance feel more open and inviting, and airy inside the courtyard. With thi s fence I added thin curved lines of cedar dancing their way across the fence, even going up into the open window spaces at the top of the fence adding another unique and fun design element. The main entrance is through an arbour with double gates. The double gates allow either a large opening with both gates open or just a pedestrian gate by opening only one sid e (one side has a cane bolt going down into a hole I drilled in a rock which is set into the ground to stop that gate from moving when not in use). 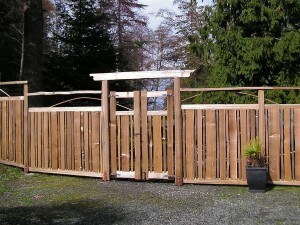 The gates are made from hand split cedar with mortise and tenon joinery pegged with hardwood. 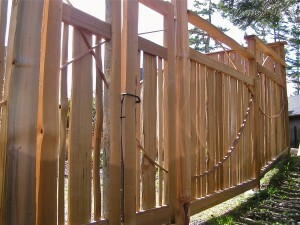 The latch is a custom made metal sprung gate latch which work best with my large handsplit gates. My friend George Hudson custom forges this hardware here on Pender Island. 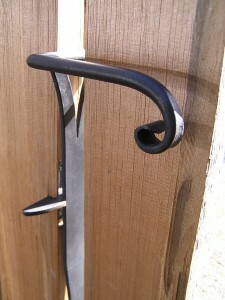 The latch is sprung, and closes into a catch set into the post or in this case with double gates, the opposite gate. It opens by simply putting a little downward pressure on the handle, releasing the latch from the catch! 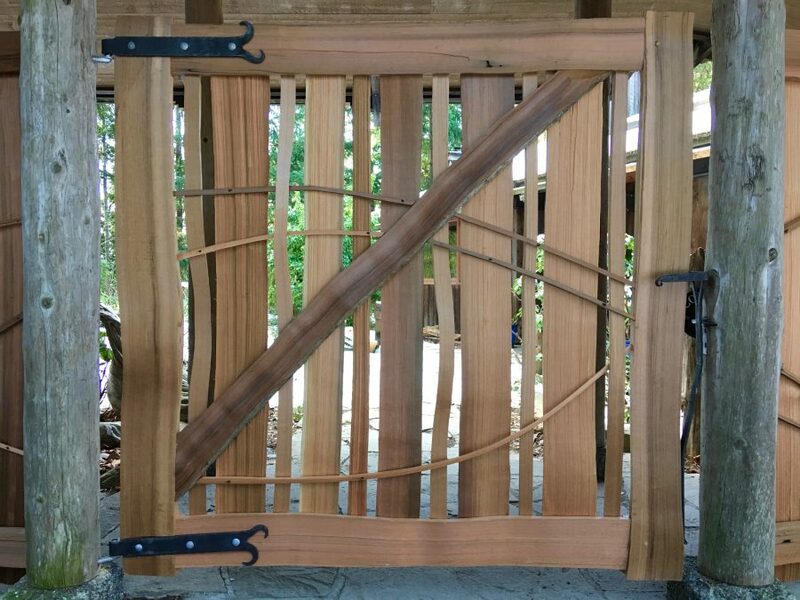 (just like the ones they used in England years ago at the top of short fences) A simple and functional piece of hardware that looks beautiful with the hand split red cedar gates. Inside the fenced area is a courtyard made up of the gardened space between the house and the old fence (which I shortened to 3 feet, so as to remain a feature in the garden) and then between the old and new fencing where a patio and new garden shed are. The shed is 8’x8′ with a covered entrance, and large overhang on one side which covers a potting table made from all the recycled wood from the old fence. I built the shed before I started the fence. 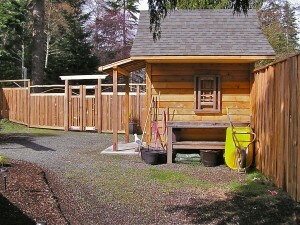 We are going to be putting in the patio this spring… never a dull moment here on Pender Island!